The action will be on Sunday, Dec. 17 in Torniella, Southern Tuscany. The program will be in a single day, still maintaining the gist of last year’s event, bringing together culture, environment, open innovation, and a cool live soundtrack. If the weather is good, you are invited to reach the valley from the morning, and enjoy a relaxing hike surrounded by forests, creeks, medieval iron works and castles. In the afternoon, we start with indoor activities. At 2.30 PM we have an enticing printing workshop by Wolfgang Scheibe . You may also bring along a T-shirt and get it printed live with your own design, under the supervision of “Steppenwolfgang”. While the ink dries up, the set up the live show by Etruschi from Lakota will be prepared. In 2016 they were the main act and the revelation for many at the Winter Fest. This year they are back during the tour to promote their third album, Giù la testa. The band will play their new tracks, as well as some of their greatest hits. Rock ‘n’roll is assured. As a backdrop to these events, and as a link to the surroundings, we will have the presentation of the updated version of the Farma Valley Community map. This has been assembled since 2015, documenting place names and other indications which are now missing from official base maps through interviews with residents in the valley. Finally, with a clear sky, starting from the late afternoon we will run some BuioMetria Partecipativa. This is a citizen science project, in fact started from the Farma Valley in 2008, and developed with national and international connections, in order to raise awareness about night sky quality. For information on potentiali itineraries, to check about food, lodging and other enquiries, please contact mappare@attivarti.org . 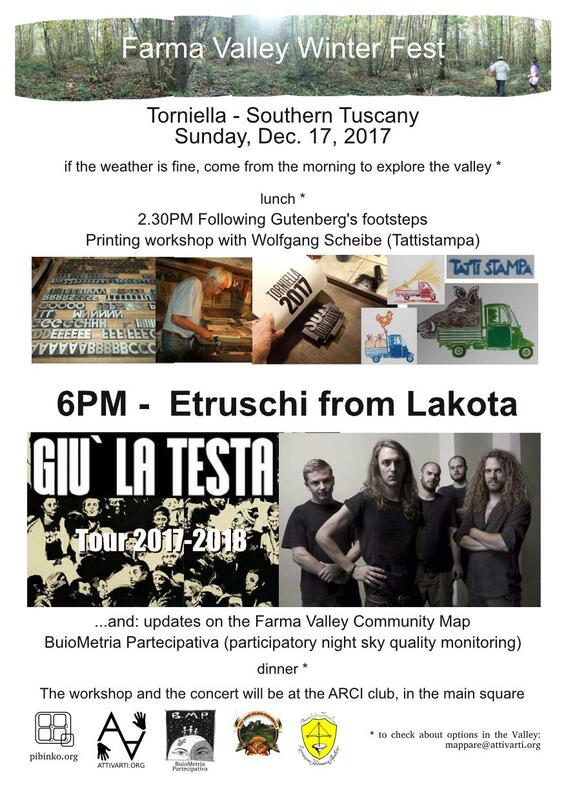 The Farma Valley Winter Fest was created by pibinko.org and is promoted by Attivarti.org, Pro Loco Piloni-Torniella, Associazione Filarmonica Popolare di Torniella.